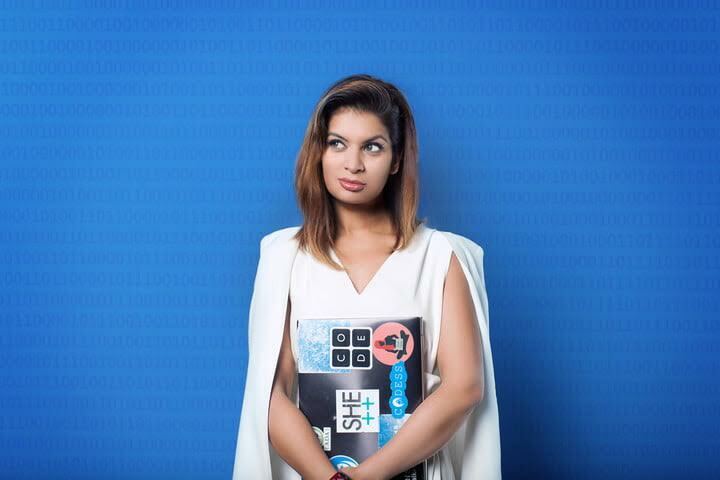 In part four of our ongoing series: Conversations with a Female Engineer, Dona Sarkar, with Microsoft’s Windows Insider Program, explains how working in fashion design helped her land a job in 3D, and why relationship building is so important for your career. I am the Chief #NinjaCat of the Windows Insider Program at Microsoft. What that means is that I lead a community of 15 million passionate fans to Windows as they help co-create the future of Microsoft technology with us. I absolutely LOVE this job. Before this, I lead developer engagement for Microsoft HoloLens where I engaged both developers and creative types (artists, sound engineers, theatre experts) on making realistic 3D worlds for Mixed Reality. Prior to that, I was a software engineer and then an engineering manager for core Windows components (pretty much anything you can click or tap on). I did but did not realize it. I wanted to work in a field where young people could lead without having to go to school for 8-12 years (like medicine or law) and I wanted a field where I could spend 80% of my time creating new things. This is exactly what the tech industry is! Only in my first internship at Autodesk did I realize how many young people were running around the office doing important things like creating the next version of the AutoCAD product. I studied BOTH! I did a Computer Science degree at the University of Michigan (where I learned how to keep on persevering after I failed my first, third, fifth, sixth and eighth classes—having to re-take every one). After graduating and working in a dev job and finding my evenings empty and lonely, I studied Fiction Writing at a community college for 3 years and wrote 5 novels (the 5th novel got published). In 2012, I enrolled myself in fashion school part time to design my own line of eco-friendly fashion (yes, it took me five tries to make something wearable). Having both art AND science has given me a career that I wake up excited for every single day. Being a fiction writer means I can communicate about dry technical topics in a much more engaging way and working in fashion design gave me the superpower of being able to visual things in 3D which helped me get the job in HoloLens. I believe diversity produces better businesses and products. What’s more, we should take an intersectional perspective on diversifying leadership – gender, LGBTQ+ identification, ability, age, socioeconomic background, immigration status, worldview, personal experience, and more all bring new insights into the table. For example, only after my team got on a plane and spent a lot of time over the course of the past year and a half in Nigeria and Kenya did we realize how absolutely vital it is to build products for a world where the electricity goes out and Wi-Fi cannot be assumed. Because my team is full of leaders, aka decision makers, we can truly influence the direction of Microsoft products. Diverse leadership is also important so young people in their careers have role models to look to. I have many mentors, both younger and older than me and both male and female, all depending on the topic. I think having mentors (people who help guide you) and sponsors (people who advocate for you) are MANDATORY for keeping young underrepresented people in technology. I am in my last 3 jobs because of a sponsor who was someone I’d worked with before. All three said, “There is a job open that you’ll love. I think you should do it.” Another example is group sponsoring. I have a group of women who I have worked with for 12 years. We advocate, guide, and sponsor each other constantly AND point each other to new opportunities. It’s so important to support others and be willing to ask for help! Just start. It’s a modern superpower. It does NOT MATTER if you fail your first attempt at coding. It took me 5 months to get a working app (which looked horrible, but it vaguely worked). Also build relationships. They are the MOST important thing—even more than your technical skills. Here is what I do: I identify someone who does something that I think is special, either technical skills or a “how they work”. I approach them and thank them for their work. I, then advocate for them on social media and to people I meet. I point them to opportunities they might not be aware of. I become their fan without asking for anything in return. Truly become their friend. You’ll find that these people will then be more than happy to help you out when you need it. How can companies encourage more women to work in tech? The main things companies can do is to showcase the cool stuff that diverse people are working on and impacting the world. Showcase what diverse teams have built and the ways it’s made the world a better place. Also, showcasing the humans behind the work is powerful and important. Being a role model makes you FAR MORE LIKELY to stay in tech and seeing role models makes you realize you belong.